Within a selectable component there are several transition options depending on what state the selectable is currently in. The different states are: normal, highlighted, pressed and disabled. None This option is for the button to have no state effects at all. Color Tint Changes the colour of the button depending on what state it is in. It is possible to select the colour for each individual state. 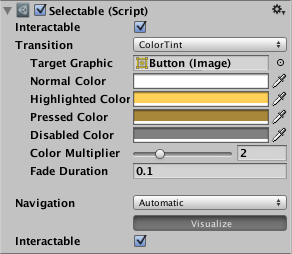 It is also possible to set the Fade Duration between the different states. The higher the number is, the slower the fade between colors will be. 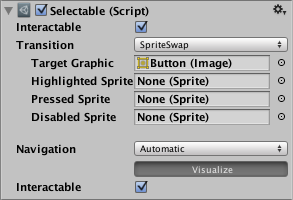 See in Glossary to display depending on what state the button is currently in, the sprites can be customised. See in Glossary is disabled. To create an animation controller click on generate animation (or create your own) and make sure that an animation controller has been added to the animator component of the button. 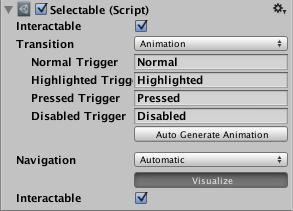 Each Transition option (except None) provides additional options for controlling the transitions. We’ll go into details with those in each of the sections below. Target Graphic The graphic used for the interaction component. Color Multiplier This multiplies the tint color for each transition by its value. With this you can create colors greater than 1 to brighten the colors (or alpha channel) on graphic elements whose base color is less than white (or less then full alpha).